We pray for his resurrection hope in every moment of death. We pray for his great reconciliation in the face of every sin. We pray for his advancement and victory over every kind of evil. You don’t have to read the papers, watch the news, or scroll through social media to know this pervasive truth: the world is not as it should be. Society is not right. Culture is corrupt. Institutions are failing. The market is not moral. Humans, in our sin, are destroying the earth as fast as we can, only to be outdone by the destroying of one-another. Jesus taught his disciples to pray these words amidst cultural chaos, in a land that looked nothing like heaven. Jesus had come proclaiming and demonstrating a world of peace, without sickness, evil, or death. 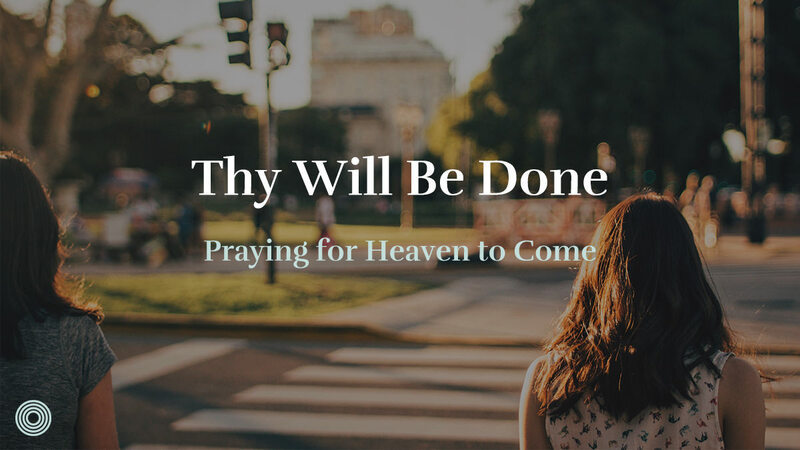 Fresh from petitioning God’s kingdom to come into our lives, into our communities, and into our world, Jesus emphasized this kingdom—God’s will on this earth. In other words, the kingdom is all about God getting his way. It means God ruling with peace, justice, mercy, grace, and love. 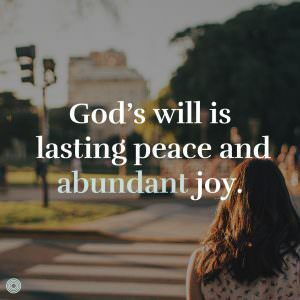 God’s will is lasting peace and abundant joy. The poignancy of this line in the prayer is found in the person praying it: Jesus prays as God’s will on earth from heaven. Jesus, himself, is God’s will on earth. He is with them. He is in charge, commanding the earth, weather, and all material. Jesus is God’s will from heaven. Paul poetically describes Christ’s laying down of all his divine attributes to take the form of man and enter humanity (Phil 2). Jesus’ birth is the advent of this prayers’ answer: God’s will has come to earth! Heaven has dipped into humanity. God is his own answer to this prayer. In Christ, God’s will is advancing on earth. What is God’s will? Jesus came into the world to make God’s will plane. God’s will is to reconcile humanity to God. The symptoms of this will are the healing of the sick, the mending of the broken, and expelling of evil. God’s will is to pour his love generously into the world through Jesus. His will is to defeat sin, death, and evil and make all things new by his own death and resurrection. The act of prayer, any prayer, is one that beckons the will of God on earth. This kind of petitioning is what prayer is. It’s a statement of belief, a realization of God’s presence in earth, a cry to the one who can change earth. Furthermore, prayer itself is an act of submission. Our prayers are always a petition for God to be with us. All prayer is about God and his will being made visible in our world. Our current American prayer crisis comes, in part, from godless prayer. We don’t seek the presence of God in our lives and world. We seek God’s activity—a to-do list. We are more like the people crowding around Jesus in Mark 3:7–12 than we’d like to admit. They pressed to be close to him to use his power for their healing. Jesus flees from these people into a boat for fear of being crushed. The people wanted healing, not a healer. They were content to use Jesus like a charm, not welcome him as Christ. In teaching us to pray, “Thy will be done on earth as it is in heaven,” Jesus instructs us to welcome God with us. He teaches us to pray centered on his mission. The gospel message of Christ’s death and resurrection is one that unifies heaven and earth. While the incarnation Christ on earth is God’s will dipping into earth, Jesus’ death and resurrection is the advancement of that will. God creates a new reality of heaven and earth in his resurrection. When we pray, “on earth as it is in heaven,” we are praying for home. We are praying as refugees without a native land we can return to. We are praying for the completeness of resurrection life into our life today, tomorrow, and forevermore. We are praying for resurrection hope. Prayer orients us toward our rest: the risen Christ whose will is on earth as it is in heaven. We pray as people between two worlds. We pray on behalf of the world. Our prayers are invitations to God: bring your will into our city, culture, government, and marketplace. This prayer is certainly one of trust and confidence in his sovereignty. This prayer is also one of compassion, empathy, and desperation in a lost and dying world. This post was originally published at www.gcdisciplehsip.com. How Do You Pray in a Chaotic World? Brad Watson serves as an equipping leader at Soma Culver City in Los Angeles where he develops and teaches leaders to form communities that love God and serve the city. He is the author of multiple books including Sent Together: How the Gospel Sends Leaders to Start Missional Communities. He holds a degree in theology from Western Seminary.